Last month, a strange plant took root in the hard soil of the Capital. Its season is rare – roughly once every five years; and its life cycle determined not by the laws of nature, but by those of the nation. Its steel stems and plastic foliage flourish in a hotbed of corruption, fertilised by the scum of ill-gotten gains. Gone now, its flowers – the beaming faces of our political hopefuls – briefly colonised every Delhi road, blooming black and white, orange and green, lotuses rising out of the muck. When, as in this election, there seems to be no ethical lines left uncrossed, one turns to aesthetics out of a sort of desperate petulance. The two are fairly inextricable when it comes to political advertising; spending on “outdoor activations” (ie, eyesores) and other marketing tools has been particularly egregious this year. It’s difficult not to wonder what this expensive, collective subjection to billboards plunged into the ground and tacked over the sky is all for. This onslaught, in what Susan Sontag has called the “theatre of persuasion” of public space – compounded with the incessant phone calls and radio spots, the infinite regress of social media updates, and high-pitch television coverage invading private space – is a convincing sign that electioneering in India has reached an unapologetically commercial apex that is disturbingly reminiscent of high-spend campaigning elsewhere in the world, particularly the United States. In 1969, Sontag wrote about political posters in Cuba in an essay (“Posters: Advertisement, Art, Political Artifact, Commodity”), in which she argued that “the aim of an effective political poster is rarely more than the stimulation (and simplification) of moral sentiments.” Expanding on this, she wrote that the most common way to simplify “a thing or an idea”, in political advertising is to attach it to “the emblematic image of a person… the heroic figure.” During this Lok Sabha election, the campaign posters in Delhi were limited to celebrated leaders, and contained the innate tension between elevating these men as heroes, and projecting their humility as self-effacing saints – what Sontag described as a “willingness to renounce private desires and liberties”. The theatre of persuasion began to look more and more like a theatre of the absurd, entirely divorced from reality. The audience of journalists and commentators watched each new act with increasingly weary fortitude. Liberals grew exasperated with other liberals, trolls trampled over all sensible dialogue and the unending debates over the existence of various waves could actually induce seasickness in our landlocked city. If the circular public conversation remained focused on ethics, in private, a lot of frustration found its final expression in the form of juvenile bitchery about the physical repugnance of the men holding court over our streets. Given the advertising invasion and its emphasis on candidates’ blown-up faces and bodies, this was understandable, if not entirely excusable. More than once, serious discussions ended up fixated on this one’s deceitful, pillowy lips or that one’s smug, doughy dimples. In a more dismissive tone, that one’s bristling, indignant little moustache. I think there was a real sense of betrayal animating these private, surface judgments – an unedited response to the hypocrisy of can­didates who are supposed to represent the people, but have made themselves the objects of veneration instead. Take, for example, the creepiness of the now ubiquitous candidate masks that turn a nameless and the faceless citizenry (sometimes identifiable only by essentialising sartorial markers) into politically-branded bodies, literally poster-stands for the logo of a candidate’s face. Or the #SelfieWithModi campaign that turned photographs of voters into an interactive online mosaic picture of the man himself – each supporter a tiny piece of his famously wide chest or grinning face. 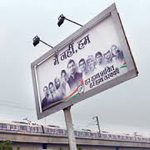 Then there was the attempt at self-abnegation in the catchphrase “main nahin, hum”, which rang entirely false when coupled with the heroic, paternalistic political imagery of campaign posters. And the petty fight between the Congress and the BJP, over which party deserved “creative credit” for that profoundly disingenuous slogan, really said it all. Originally published in Time Out Delhi, May 2014.